The M hybrid, which uses Nissan's first in-house hybrid drive system, has a 3.5-liter V-6 engine, makes 350 hp and has an EPA-rated combined fuel economy of 29 mpg. 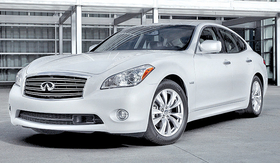 Nissan Motor Co.'s premium Infiniti brand has priced its 2012 M hybrid sedan at $54,575, including delivery. The sedan, the first hybrid in Infiniti's U.S. lineup, will go on sale March 16. The sedan also will be offered in four nonhybrid versions, which go on sale March 2. The nonhybrid M37 has a starting price of $48,575, the M37 with all-wheel drive is priced at $50,725, the rear-wheel-drive M56 with a V-8 engine is priced at $59,975 and the M56 AWD is priced at $62,475. Prices include delivery. Ben Poore, Infiniti Business Unit vice president, said the M hybrid will feature prominently in TV spots during the NCAA men's basketball tournament this spring. The commercials will coincide with deliveries of the sedan to dealers. In 2010, Infiniti brand sales rose 28 percent from 2009, to 103,411 units.